Much unlike what most cartoons would leave you to believe, this cat, rat and dog trio are the best of friends. "The Rat Pack," consisting of Sasha the dog, Jack the cat and Tweaks the rat, were turned over to a Wisconsin shelter last month after their previous owner had to move, and was unable to bring them with her. 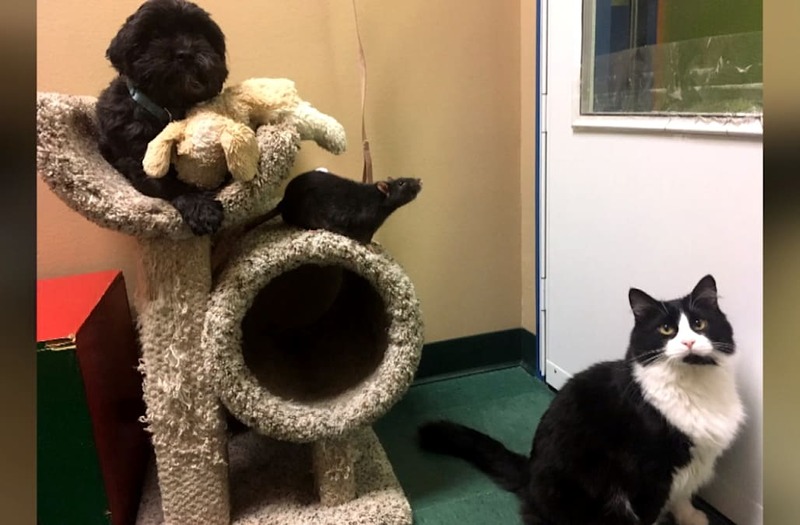 "We really had to see the bond to believe it because we had never heard of a cat, rat and dog playing together and giving each other kisses," Jennifer Ollanketo of the Oshkosh Area Humane Society told InsideEdition.com. She explained the trio were separated during their initial examination, and it became obvious Jack, who is 5 years old and visually impaired, was having a hard time adjusting without his friends. "Jack the cat became very anxious and upset," Ollanketo said, "and when we reunited them, he calmed down, so that showed us he needed his buddy Sasha around to feel safe." Tweaks, who is considered a senior rat at two years old, loves to climb around, wrestle, or just lay on top of his two best friends. After spending five weeks in the shelter, a woman interested in taking home a dog and a cat had her eye on Sasha and Jack. "We knew Jack and Sasha had to go to a home together since Jack would become very anxious without Sasha," Ollanketo said. "However, after we saw the bond they had we wanted to try to see if someone would be willing to take all three so they wouldn't have to be separated." Although she had no experience with rats and was hesitant to add Tweak to her family, Ollanketo said the moment they met, it was love at first sight. Now, "The Rat Pack" spends their days lounging and playing in their new loving home.